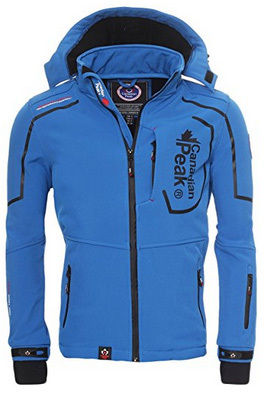 In today’s article, we will be featuring some new products: a new line of outdoor clothing launched by Geographical Norway called Canadian Peak, which comes with innovative designs at a reasonable price, considering the quality and performance of these products. From this collection, we have selected several of their best jackets, for you to take a look at. 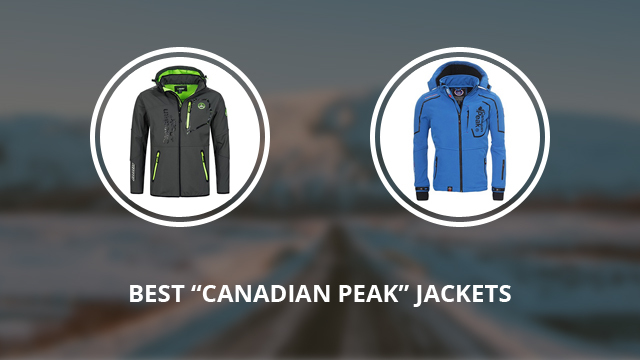 However, because Canadian Peak is still being updated with new products, we will also keep updating this selection, to feature their newest and best jacket designs. For now, the ones selected are detailed below. 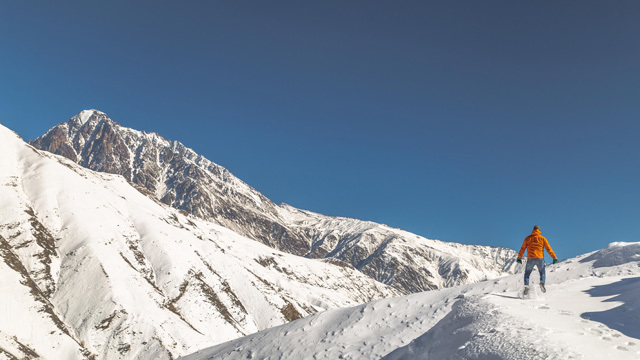 Let’s kick it off with Triyuga, a softshell jacket for men, which is made of 100% Polyester. The outer shell is windproof and it is water-resistant, as well, with a water column of 3000mm. The inner layer is smooth polyester, highly breathable, with a respiratory activity of 5000 gr/m2/24h. It comes with a medium-height collar, with chin guard to prevent chafing from the main zipper. Speaking of which, it is water-resistant, uncovered, but with a back lining, to further prevent water from getting through. There is also a detachable hood, which is adjustable and fastens with Velcro in the front. There are two side pockets, one wrist pocket and one chest pocket on the left side, all with water-resistant zippers. The cuffs are adjusted with Velcro fasteners and come with wrist gaiters. The color selection includes: Blue, Black, Red, Grey and Green. Tacyte is also a softshell jacket, which comes with Turbo Dry 5000 technology, that makes the outer shell fast-drying and breathable. The outer material is a blend of 96% Polyester and 4% Spandex, which makes the jacket a lot more comfortable to wear and the movement more fluid and easier. It is a water-resistant shell, with a 3000mm water column and also windproof. The inner material is 100% Polyester fleece, very breathable, with a respiratory activity of 5000 gr/m2/24h. 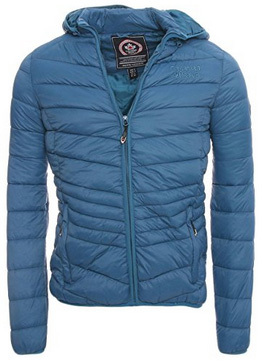 It is a thicker lining than usual, which provides warmth, while also insulating the jacket. The detachable hood is also lined on the inside, and is adjustable with drawstrings on both sides. The collar is medium-height, with chin guard on. It comes with three outer pockets, all with water-resistant zippers, while the two side ones are lined on the inside to keep the hands warm. There are drawstrings in the bottom hem, and the cuffs are elastic. On the sleeves and back, there are reflectors, to make the jacket visible at night. It comes in the colors: Red, Black, Blue, Yellow and Grey. Next up is Chapeak, an outdoor jacket, designed for everyday wear. It is made of 100% Nylon for the outer lining and 100% Polyester on the inside. 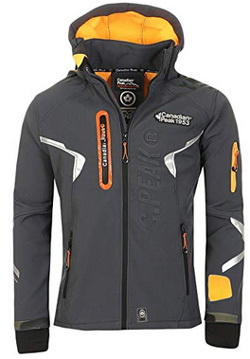 This is an insulated jacket, water-resistant and windproof. It comes with polyester padding, that makes it bulkier, yet lightweight and very comfortable to wear. It also provides warmth, as well as insulation. This is a quilted jacket, in a mixed pattern of horizontal and diagonal quilting, extending along the sleeves, too. The cuffs are elastic, as is the bottom hem. It has a high collar, with chin guard for the zipper, and a detachable hood to the back. On both sides there are two large zipper pockets, lined on the inside to warm up the hands and with enough room for small belongings. There are seven colors available: Blue, Orange, Black, Light grey, Dark blue, Dark grey and Red. UBER is a fleece jacket that comes with a medium height collar, which is hoodless and closes up fully by the central zipper. 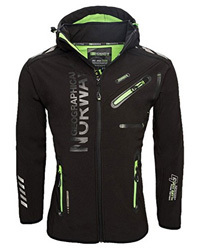 The zipper is concealed in order to make it more difficult for cold winds to get through. It is made of 100% Polyester fleece, which is smoother on the outside, with the inside being a lot softer. 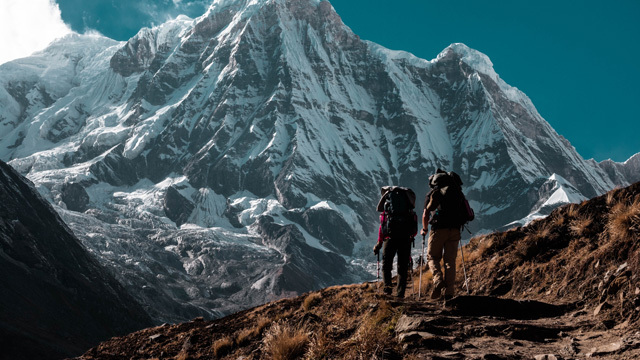 This is an insulating jacket that, much like typical fleece jackets, can either be worn on its own outdoors and even indoors, or as part of a layering system under a heavier and more weather-resistant shell. There are two zippered pockets on the sides, as well as one on the inside, and it also comes with standard sleeve cuffs. There are drawstrings inside the hem, which help close the jacket off from the outside cold. You can get this design in two colors, which are: Black and Grey. Ultona is also a fleece jacket, which comes with a stow-away hood, as well as an adjustable medium collar that helps prevent the cold from getting through, while also keeping your neck warm. Its sleeve cuffs are elasticized, which provide not only a better fit but also better insulation. Speaking of which, this jacket comes with the DryTech technology, that insulates very well and manages to keep you warm at a comfortable temperature, without much overheating. While fleece jackets in general are not too water-resistant, Ultona is different due to the DryTech technology mentioned above, as it also helps keep you dry in mild rain. 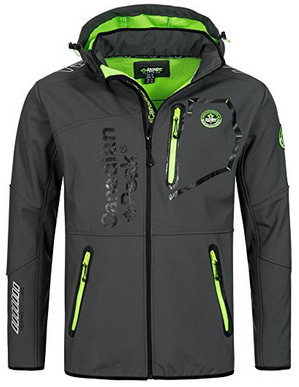 The inside of the jacket is made of tight mesh lining that helps with breathability. 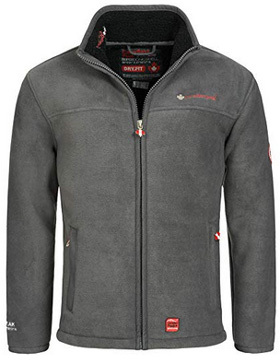 This jacket is available in the colors: Gray, Black and Red. 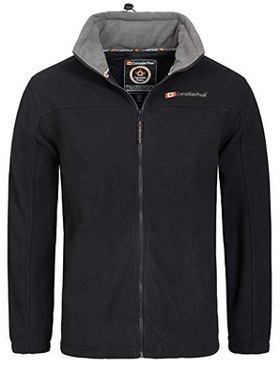 Transatlantic is a softshell jacket designed for different outdoor sports and activities. It is made of Polyester and it comes with a detachable hood that adjusts with drawstrings. It is wind and water-repellent and can withstand rain and wind. This is a design suitable to be worn in later Autumn/early Winter as it is not excessively warm. There are wrist gaiters in the sleeve cuffs, which are also adjustable with Velcro fasteners. It comes with two side pockets, one chest pocket, one sleeve pocket and also an inside pocket. There are reflective strips and patches both on the body and on the sleeves, which will help keep you visible in bad weather and bad lighting. This design is available in five colors: Black, Red, Dark gray, Blue and Dark blue. Ascoli is a black parka that comes with a hooded collar that adjusts on both sides with drawstrings. 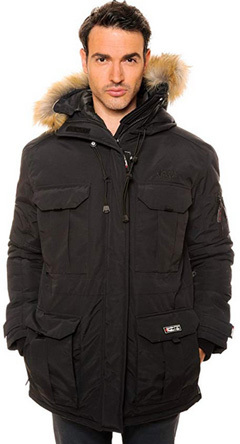 It is an entirely synthetic parka, including the detachable fur trim on the hood. This design was made with practicality in mind as it comes with several large pockets on the outside and inside, six of which are on the front and one on the left sleeve. Two of those pockets are intended as hand-warmer pockets and can be easily accessed with or without gloves on. 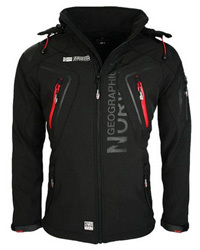 The central zipper is covered by a storm placket in order to help ward off rain and snow, as well as wind. 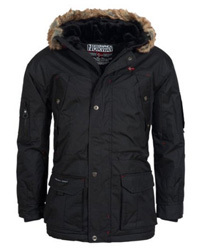 This is a mid-length parka that adjusts at the waist with drawstrings placed inside. 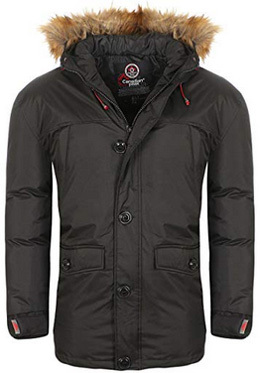 A heavy winter jacket, this design comes with an adjustable hooded collar and faux fur trim around the hood. The outer shell is water-resistant as well as wind-resistant. This is a very casual style design that can be worn as a day-to-day jacket, as well as to work due to the lack of flashy logos. The color selection, which features the option: Black, Dark blue and Khaki makes it all the more suitable for work as these are all classic colors. On the outside there are four pockets, the lower two are flap ones and the ones on the chest are zippered. The sleeve cuffs are adjustable with Velcro fasteners and the central zipper is covered by a buttoned storm placket to minimize contact with rain or snow. Flashy Lady is a women’s sweat jacket that is made of 65% Cotton and 35% Polyester. It comes with a hooded collar that adjusts with draw cords. There is a split kangaroo-style pocket on the center and a slightly concealed central zipper. 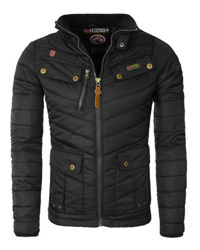 This jacket comes in a sporty look that is great for casual wear as it is very comfortable, too. It comes with a wide, elastic hem and elastic wide sleeve cuffs, too. This is a warm jacket intended for autumn/spring wear but you can definitely wear it as a layer under a thicker winter coat. It comes with brand logos on the upper part of the body and is available in the colors: Grey, Pink, Blue, Red and Black.